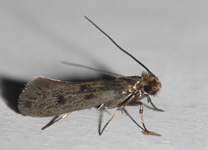 The dreaded clothes moth comes in a number of formats but the most commonly found in UK homes are Webbing Clothes Moth (Tineola biselliella)and Case Bearing Clothes Moth (Tinea pellionella). Others that may be encountered are the White Shouldered and Brown House Moths. The Webbing Clothes Moth (left) is found in many a wardrobe and chest of drawers and will usually attack the very best natural materials, such as cashmere! Damage is usually just small holes but an attack can be very expensive as one hole can render a £200 garment unwearable! Webbing Clothes Moth as so named because they leave trails of silken thread where they are active. Life cycle can take up to three years. Average female lays 40-50 eggs. The Case Bearing Clothes Moth (right) is more commonly found attacking carpets and soft furnishing and can cause very significant damage. Having a life cycle at least twice per year and laying around 60+ eggs at a time, the Case Bearing Moth is a destructive beast. This moth is eaier to locate than the webbing model! It lives its larval stage in a pupal case and these cases can be found littering the infested area. Sometimes they take on the colour of the fabric being eaten but most commonly are whitish and look like pieces of cooked rice. You can see the brown head of the larvae at one end if they are active. As with most pests, hygiene is the key to control. Vacuum the insides of wardrobes, storage areas and hidden floor areas regularly and try not to store soiled clothes as these are much more readily attacked by moth. Move clothes regularly, check for moth activity, take outside and shake or brush. The Roller Clothes Brush is useful for removing moth eggs from close knitted and woven clothing. Keeping clothes in proper covers can reduce the risk of attack significantly and installing deterrents into wardrobes and drawers, such as Cedar Balls and Aromatics, will deter moths fromsetting up home and destroying your clothes. If clothes are found to be infested, then, if not too damaged, they can be placed in polybags (sqeeze air out) seal and freeze for 72 hours. This will kill larvae and eggs. There are no insecticides that you can safely apply to clothes but it would certainly help to spray the insides of storage cupboards and drawers with insecticide. Little can be done to protect carpets other than regular vaccuuming of hidden areas. Infestation in carpets will almost certainly need chemical application to remedy. Some natural fibre carpets are pre-treated with insecticide in production but this is not a guarantee that the carpet will not still be attacked.